Coral Discoverer is a small ship purpose-built for expedition cruising in Australia, Asia and the South Pacific. Thanks to its monohull design and manoeuvrability, it can navigate narrow crossings and shallow waters that bigger cruise ships can't, which means passengers get to feel like intrepid explorers heading into uncharted waters. When it launched in 2005, Coral Discoverer was the first Australian-flagged passenger vessel in 50-plus years to attain full SOLAS (Safety of Life at Sea) compliance. The ship has a number of Rolls Royce active stabilisers to comfortably handle open waters, and the crew is adept at navigating the tropics. Being a small ship, the Captain can easily change course and itinerary if the weather proves inclement or there are rough seas. The ship has a small exploration vessel called the Xplorer that seats all passengers, making twice-daily outings an all-inclusive affair. Passengers don't have to wait or book ahead to take part in shore excursions and can board easily from the main deck without getting their feet wet. 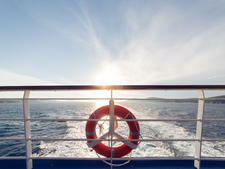 The shore itinerary caters for all levels of passenger mobility, with shorter or easier activities for those less able. Passengers wanting an outing without the challenge can choose to remain onboard the Xplorer. With capacity for just 72 passengers, Coral Discoverer is an intimate cruising experience. Friends are made quickly and many passengers will say that one of the best things about the ship is the people you meet. The ship has a no seating policy at meal times and the four and six-person seating arrangements are a great incentive for passengers to get to know one another. Originally known as the Oceanic Discoverer, Coral Discoverer was renamed in 2015 and refurbished in November 2016. The refurbishment saw six luxury cabins with balcony and French doors added to the Bridge Deck. The sundeck also got a makeover, with a bar replacing the spa, and a sunshade and sunloungers added. It's here in good weather that evening drinks are held, and the dramatic sunset skies and relaxed ambience are a daily highlight. Being a small ship, there are plenty of social areas in which to chat with fellow passengers but the ship never feels crowded. Passengers can just as easily find a quiet spot to read a book or look out at the passing scenery. A cross-trainer and exercise bike located outside on the Promenade Deck is a great way for active passengers to keep fit. For those with mobility issues, there are no elevators on the ship, only stairs. Some are steep but all have handrails. On the Arnhem Land cruise, a passenger with mobility issues managed without needing assistance. Cruising with Coral is an enriching experience where passengers can gain in-depth knowledge about the destinations they visit. On board are expert lecturers -- from geologists and anthropologists, to park rangers, marine biologists and historians -- and the daily lectures are, for the most part, insightful, informative and entertaining. There are evening documentary screenings for night owls and these add to the learning experience. With no late-night bars or clubs, days on Coral Discoverer begin early and usually wind down by 10 pm. What the ship lacks in a party atmosphere, it makes up for with daily adventures. The open bridge policy gives passengers an opportunity to sit on the bridge and chat to the Captain and crew any time the ship is underway. There is a high bench seat for excellent views and binoculars for spotting dolphins, birdlife, and land. One of the best things about cruising with Coral is its largely Australian and New Zealand crew who go out of their way to ensure the comfort, safety and wellbeing of passengers. The same can be said about the cruise lecturers who join passengers at mealtimes and are only too willing to impart knowledge and wisdom. Sharing a table with these experts is a great way to gain further insights on destinations. With itineraries around the 11-day mark, Coral Discoverer attracts passengers with time on their hands: retirees, semi-retirees and people keen to tick off a bucket list destination. Most passengers are Australian, mature in age and comfortably wealthy, with married couples and friendship groups the mainstay. Many are on their second, third or fifth cruise with Coral Expeditions -- and passengers will cite the wonderful lecturers and extraordinary destinations as the reason they keep coming back. Casual dress is the go on a Coral Discoverer cruise. With plenty of shore excursions, passengers tend to dress according to the day's itinerary, reverting to smart casual for sunset drinks and dinner. Things get a little dressier at Captain's Drinks, but the fanciest you'll see is a linen shirt or dress sandal. Given the narrow stairs between decks, high heels are eschewed in favour of comfort and mobility. On reef itineraries, snorkelling equipment is provided. Passengers onboard Coral Discoverer can expect an expedition where most things are covered in the cruise fare. This includes all meals, tea and espresso coffee, shore excursions, lectures, and house wine, beer and cider during lunch and dinner service. Passengers can access the Wi-Fi for a fee. Gratuities are never added to your onboard account or bar bills -- nor is tipping required. Passengers who want to reward good service can do so with a cash donation to the purser who will share it among the crew. The onboard currency is Australian dollars. 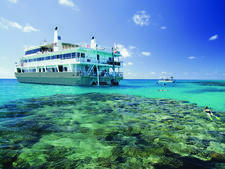 Coral Expeditions II was purpose-built for the waters of Australia's Great Barrier Reef, and is ideally suited to exploring the UNESCO World Heritage-listed Marine Park. 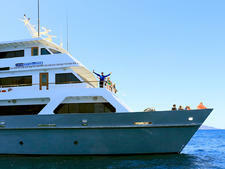 Coral Expeditions I is a small catamaran built for expedition cruising in Australian waters. With just 46 passengers and 10 permanent crew members, the experience is very intimate. The largest of Coral Expeditions' ships, 120-passenger Coral Adventurer features two tenders, six Zodiacs and all cabins will have views, most with balconies.